Noted for his ability to play the puck, Rimouski goaltender Colten Ellis calmly swats the puck to an open defenceman during Friday’s 5-3 win over Cape Breton to clinch their QMJHL playoff series. Skilled, focused, and a winner. All those adjectives, and more, can be used to describe River Denys native Colten Ellis. Ellis was in Sydney last week where the 18-year-old goaltender backstopped the Rimouski Oceanic to a 4-1 series win over the Cape Breton Screaming Eagles. 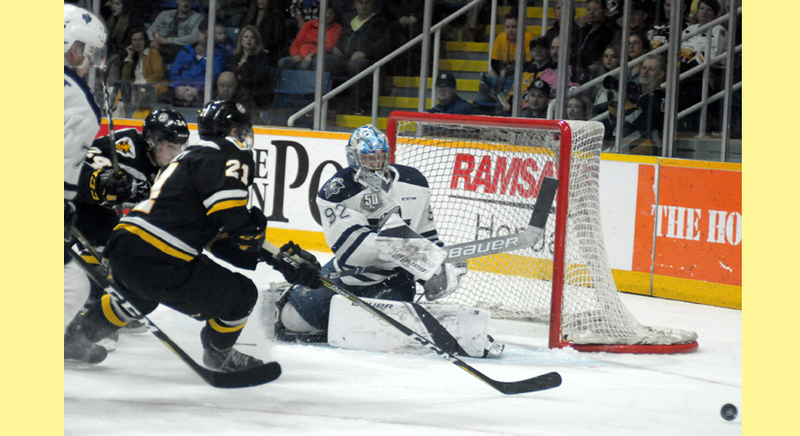 Rimouski clinched the series on Thursday with a 5-3 win at Centre 200. It was the eighth win in nine starts for Ellis thus far in the Quebec Major Junior Hockey League playoffs. Ellis, who is known for his ability to play the puck, had an assist in Thursday’s win. More importantly, his goaltending statistics in the playoffs have been stellar, recording a save percentage of .930 and a goals-against average of 1.83. And one of his eight wins was by shutout. Rimouski coach Serge Beausoleil said making Ellis his starter last year was an easy decision, though this year they cut back on his starts down the stretch. Ellis said he’s learned a lot since his rookie season. “I feel great now. Last year I wasn’t playing close enough attention to my body and got a little run down going into the playoffs. This year the amount of games has been perfect and I feel fresh now,” he said. Ellis faced just 24 shots in Thursday’s win and he gave credit to his defence for keeping the shots down. The game started with three consecutive powerplays awarded to the Screaming Eagles in the first six minutes. Cape Breton was up 2-1 in the first and the game was tied 3-3 early in the third before the Oceanic put the game away with an even-strength goal and an empty-netter. At the other end of the ice, Cape Breton goaltender Kevin Mandolese did everything but score to keep the Eagles’ chances of extending the series alive. Afterwards, during the handshakes, Ellis and Mandolese exchanged some words. The Oceanic next face the Rouyn-Noranda Huskies in a best-of-seven QMJHL semifinal series. The other semifinal has the Halifax Mooseheads and Drummondville Voltigeurs squaring off. Ellis said he has adapted well to life in Rimouski and is slowly improving his French. Ellis is currently ranked seventh among goaltenders by Central Scouting who are eligible for the 2019 National Hockey League draft. It is projected he will go in the second or third round of the draft. Ellis said he didn’t want to speculate on the draft, only to say teams are showing interest in him. The Sport Testing Combine is a way for NHL teams to gauge the fitness and ability of prospective draftees. At the last Combine in January, in specialized sport testing for goalies, Ellis claimed top honours in an array of reaction, agility, and movement challenges. But for now, Ellis is still on the road to Halifax where he hopes his team will make it to the Memorial Cup. After that, there will be little rest for him.